As in previous years, HHS will continue to work with you to improve the consultation process. the New Year so that you can prepare your thoughts, ideas, and recommendations. HHS Annual Tribal Budget Consultation Pre Registration. Register now to learn more about the world of opportunities an Indian health career has to offer. Presenters at the National Indian Child Welfare Association’s (NICWA) 35th Annual Protecting Our Children National American Indian Conference on Child Abuse and Neglect, this year being held in San Diego, California, on April 2–5, 2017, are the heart and soul of this annual event, increasingly recognized as the premiere national gathering dedicated to tribal child welfare and well-being. Each year over 70 presenters are selected to lead vigorous dialogue about best practices, current research, advocacy efforts, policy implications, and other lessons learned with over 1,000 conference attendees. Workshop sessions will be 90 minutes in length. Participation varies depending on topic, but on average workshops will have between 20–70 participants. NICWA highly values interactive and participatory workshops. Please share in your submission how your workshop will help conference attendees learn through interactive learning. For more information on the workshops, click here. All proposals must be submitted online here. We have put together a tool to help you draft your proposal here. This year, we will accept proposals until Thursday, November 17, 2016. All presenters of selected workshops are required to register for the conference. NICWA offers a reduced registration rate for up to three presenters per workshop. You may register at the presenter rate once your workshop has been accepted. Additional presenters must register at the prevailing rate. By submitting a proposal, presenters agree to pay registration costs and travel costs. The richness of our conference is a direct reflection of the diversity of presenters that come to share their experience and contributions to the field. NICWA truly values a wide representation of presenters from varied backgrounds and communities. Consider contributing to the field of tribal child welfare by presenting at NICWA’s 35th Annual Protecting Our Children Conference. We hope to see you there! TRAVELING SOUTH ON I- 5 FROM WASHINGTON – Merge on to I-405 S, exit 302 B toward US 30W/ Beaverton/St. Helens. Merge on to US 26W/Sunset Hwy W. Take exit 62B, Cornelius Pass Road North. Turn right on to Cornelius Pass Road. Take 1st left at stop light on to NW Wagon Way. Liberty High School will be on the right. TRAVELING NORTH ON I-5 – Merge onto OR 217N Beaverton/Tigard Fwy N via exit 292A. Merge onto US-26 W/Sunset Hwy W via the exit on the left toward Tillamook/Astoria. Take exit 62B, Cornelius Pass Road North. Turn right on to Cornelius Pass Road. Take 1st left at stop light on to NW Wagon Way. Liberty High School will be on the right. TRAVELING WEST ON I-84 – Merge on to I-5 S toward Salem/Beaverton. Merge on to I-405N toward City Center/US- 26 W/Beaverton. Merge on to US 26W/Sunset Hwy via exit 1D toward Beaverton/Ocean Beaches. Take Exit 62B, Conelius Pass Road North. Turn Right on to Cornelius Pass Road. Take 1st left at the stop light onto NW Wagon Way. Liberty High School will be on the right. The U.S. Department of Health and Human Services (HHS) Region 10 will conduct its annual Tribal Consultation for Tribes in Alaska, Idaho, Oregon, and Washington on Wednesday April 12, 2017 at the Suquamish Clearwater Casino Resort, 15347 Suquamish Way NE, Suquamish, WA, 98392. We will also hold 1-1 meetings with Tribal Leaders upon request on Tuesday April 11, 2017 at the same location. If you do not request such a meeting, you do not need to attend Day 1. Day 1 (Tuesday April 11) – One-on-One Meetings: This short meeting is an opportunity for you to briefly share concerns and information specific to your tribe or tribal organization with federal officials from HHS operating divisions. It is not intended to be a formal consultation. Day 2 (Wednesday April 12) – Tribal Consultation: The agenda for Day 2 is still in development but will include Opening and Tribal Blessing, Regional Welcome, Tribal Leader Introductions, Open Tribal Leader Comments, and Closing Remarks. Step 1: Respond to the link below to schedule a one-on-one meeting Tuesday April 11 (if you wish to have one) and to attend the Consultation on Wednesday April 12. Please respond to the survey by Friday March 31, 2017. If you are not scheduling a one-on-one meeting, you do not need to attend on Day 1. There are limited slots for one-on-one meetings; once we finalize a schedule we will confirm the time and location for this meeting. Step 2: Secure hotel accommodations at the Suquamish Clearwater Casino Resort by Monday, March 20. Please contact the Suquamish Clearwater Casino Resort reservations at 1 (866) 609-8700 and provide them with our Group Code 11048. Please secure your accommodations by Monday, March 20, 2017 to receive the special rate of $91/night. Travel from SeaTac Airport by taxi/shuttle/light rail to downtown Seattle, then ferry ride to Bainbridge Island. The Resort has a shuttle that picks-up at the ferry terminal (M-F 9am-12:30am; S/S 5am-12:30am) and will transport you the 7 miles north to the Resort. The American Indian Health Commission (AIHC) is a Tribally-driven, non-profit organization in Washington State. The AIHC is comprised of delegates appointed by resolutions from 28 Tribes and two Urban Indian Health Organizations. The AIHC’s mission is to improve the overall health of American Indian and Alaska Natives through advocacy, policy and programs to advance best practices. This meeting is on monday April 17th before the Quarterly Board Meeting at Quinault Casino and Resort, Ocean Shores, WA. The following message and attached Save-the-Date document serve to provide information regarding the Patient Registration and Patient Benefits Coordination Training that will be conducted on April 18-21, 2017 in Albuquerque, NM. The intended audience is staff who is directly responsible for patient registration and/or patient benefits coordination functions within the Indian Health Service, Tribal Health Programs Operated under P.L. 93-638, and Urban Indian Health Programs. This may include staff from the Business Office, Purchased/Referred Care, Health Information Management, and/or other departments. The training is sponsored by the Indian Health Service – Office of Resource Access and Partnerships and is being coordinated in partnership with the National Business Office Committee. A draft agenda is attached. Please note that times and topics are subject to change slightly. A final agenda will be posted to the registration site when it becomes available. Registration is available for in-person (classroom) participation and remote (eLearning) participation. The respective registration details may be accessed by clicking the training class topic, “Patient Registration and Patient Benefits Coordination Training,” at https://www.ihs.gov/RPMS/index.cfm?module=Training. Registration is limited for both methods of participation. If your request for registration is approved and you later determine that you cannot attend, please send a cancellation request directly to IHSBusinessOffice@ihs.gov. That may allow for another person on the wait list to attend. Lodging accommodations and transportation arrangements are to be made on your own. There is no hotel room block for this training. Attached is a lodging attachment titled, “NIPTC Hotels,” which was provided by the National Indian Programs Training Center that you may refer to if you choose. If you have a question that is not addressed on the registration site or the documents attached, you may send your question via e-mail to IHSBusinessOffice@ihs.gov. Please forward this information to the Indian Health Service, Tribal Health Programs Operated under P.L. 93-638, and Urban Indian Health Program staff that may be interested in this training opportunity. Thank you for your time and consideration. The abstract submission deadline for the 13th Circle of Harmony Conference is October 28, 2016. If you have not submitted your abstract, please do so by the end of the month. All abstracts must be sent to Ayn Whyte, awhyte@aaihb.org. The Call for Abstracts is attached. Please visit the conference website www.aaihbcircleofharmony.org for more information on registration, scholarships, lodging, etc. The Self Governance Communication & Education Tribal Consortium (SGCETC), Department of the Interior (DOI) and the Indian Health Service (IHS) will host the 2017 Tribal Self-Governance Annual Consultation Conference April 23-27, 2017 at the Spokane Convention Center located on the beautiful Spokane River which runs throughout the city and is conveniently located near the Riverfront Park in downtown Spokane. This year’s theme “Progressive Partnerships: Investing in Tribal Nation Building” coincides with the introduction of new Federal administration and will lend itself to enhancing this year’s conference which will be one loaded with numerous information opportunities and time to meet with federal partners to advance the partnerships we have built over the span of past administrations.Those interested in Self-Governance, Federal partners, and Tribal organizations should attend the conference to participate in the national discussion, to share best practices and to network with Self-Governance Tribal leaders, coordinators, and advocates. We hope to see you in Spokane soon. Thank you to the 2017 Annual Tribal Self-Governance Consultation Conference Sponsors! Description: The 1.5-day meeting is to discuss the evaluation survey summary, review and revise draft instruction and templates, set percent levels, and set calendar dates for the next budget cycle. At the NPAIHB training room 4/25/2017 from 8:30 AM to 5:00 PM. The title of the course is: Microsoft Access 2010 Introduction. Inspire, motivate, energize and celebrate participants working in Native children’s health and fitness. Advance knowledge and practices to prevent Native childhood obesity and diabetes. Foster dialogue, encourage partnerships and build networks among conference participants. Protecting Indian Health and Human Services Programs and their Beneficiaries: The Basics of Health Care and Grants Management Compliance Many tribal programs receive funds from the Department of Health and Human Services. Description: IHS Information Systems Advisory Committee [ISAC] Meeting. See list of hotels attached. The Indian Health Service (IHS) Direct Service Tribes Advisory Committee (DSTAC) will hold its quarterly meeting on May 3-4, 2017, at the Radisson Hotel Portland Airport. During this meeting IHS Leadership will provide updates on Agency priorities and continue discussions regarding DSTAC health priorities and strategic planning. All Advisory Committee Representatives are encouraged to attend this meeting and must contact their respective Area Federal Liaisons for air travel arrangements and reimbursement requirements for lodging, per diem, local transportation, etc. Attendees are responsible for making their own hotel reservations and should request the special rate of $139.00. A block of sleeping rooms has been reserved at the Radisson Hotel Portland Airport. Call (503) 251-2000 and request the “DSTAC Quarterly Meeting” room block. Reservation cut-off date is Friday, April 28. The hotel is located 9 miles from Downtown Portland. You may take the free shuttle from the hotel to the airport to ride the Portland Rail System, also called the MAX into Downtown. Here is a link to a map of the MAX https://trimet.org/maps/img/railsystem.png. The closest stop to the rail system is located at the airport on the red line. The hotel is located less than 3 miles away from the Portland International Airport and offers free shuttles to and from the airport (http://www.flypdx.com/PDX). Emmalani Longenecker, Management Analyst, Office of Direct Service and Contracting Tribes; tel. (301) 443-1104; email Emmalani.Longenecker@ihs.gov. 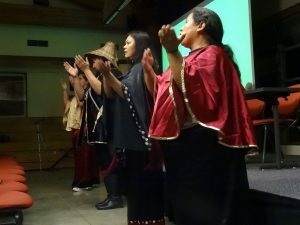 The 2nd annual Indigenous Climate Justice Symposium will be held at Evergreen’s Longhouse Educational and Cultural Center on Thursday, May 4, and Friday, May 5 at (10:00 am-4:00 pm). Open to the campus and community, the Symposium will include panels of frontline community members, student presentations, cultural events, skills workshops, whether on climate change effects, fossil fuel resistance, or community resilience and adaptation. The Thursday keynote speaker (7:00 pm) is Faith Spotted Eagle (Ihanktonwan Dakota/Nakota), a key leader in the fights to stop the Keystone XL and Dakota Access Pipelines. The Friday evening speaker (7:00 pm) is Rueben George (Tsleil-Waututh), a leader against KinderMorgan pipeline expansion in B.C. Invite friends on the facebook event page. The Northwest Indigenous Youth Day will be held on Sunday, May 7, at Nisqually, co-hosted by the Nisqually Tribe. It is open to Native and Pacific Islander youth, including middle school, high school, college-age students, Indigenous youth group members, and canoe families. The Youth Day will include basic workshops on fossil fuel resistance and climate change resilience, youth role models talking about protecting their communities, sharing inspiring and hopeful success stories and skills, having traditional foods and gathering by the Salish Sea, and keeping in touch with other youth protecting their land and water. Download an invitation here.